Born and raised in California, Shane never dreamed the grass would be greener in Ohio. But after years of drug addiction and continuing on a downward spiral he found himself on the move. Looking for a brighter future, he ended up in Ohio. "I was a meth user so I tried to get away from it by leaving the state (California). I had an opportunity to come here so I did," Shane began, sharing his story. Drug use, along with escalated drinking and arguments with his father led him to the Haven of Rest, a local homeless shelter. "I pretty much gave up on everything," Shane said. Once at the Haven he decided to leave, but things only got worse in his life so he went back. "God gave me a second chance and I haven't looked back since," Shane said of his transformation since deciding to stay at the Haven. "I came here with an open heart and mind because I had no other choice but to give it up to something or someone, which happens to be God. Ever since I've been here my life has drastically changed," he said. "I've been in Ohio for 3 years. I was 215 pounds when I came here, now I'm pretty healthy. I've been clean off meth and just celebrated 13 months clean and sober from alcohol," he continued. Shane now believes in God and reads his Bible on a consistent basis. "I've been blessed so much since I've been here," he shared. Aside from being blessed spiritually he's gotten his driver's license back, his GED, and graduated from the Haven of Rest's men's program. "The main thing that I never thought I'd get was my GED," he said, smiling at the achievement. "Look what God does in your life once you let him in," he said. He is now a first-shift intern at the Haven. Having been homeless and walked in their shoes makes him a great candidate. "Every opportunity I get to minister to the guys is a blessing," he said, "It's a lot of work but I enjoy it." He recently even applied for a permanent job at the Haven. "I just love the Haven for everything they've done for me. They've changed my life completely. If it wasn't for them I don't know where I'd be right now," he said. Being involved as an intern at the men's shelter is definitely an eye opening experience. "Everybody has a different story. I've heard some that even made me cry," Shane said. "When I work (with the men) it's not just a job, I get a chance to talk with some of the guys. Some of them don't want to listen, and others know their Bible better than me and they're helping me grow, which is going to be a lifelong journey," he explained. 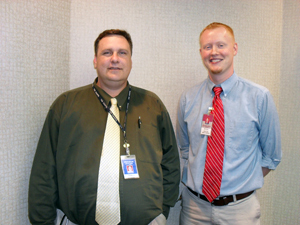 Jim Coleman, Director of the Men's Division at the Haven or Rest, has worked closely with Shane, overseeing his recovery. As for working with men at the Haven, Coleman says "It's much harder than I ever thought it would be, but much more rewarding than I ever anticipated." Men come through their doors at all hours of the day, with all types of problems. "There are so many personalities that come through the door," Coleman said. "The depth of hurt that a lot of people bring in with them is very deep. Being consistent, respectful, and confirming their dignity (is important) but being truthful at the same time and speaking the truth in love. That's what's challenged me deeply," Coleman says. Since starting his job at the Haven, his views on the homeless have changed. "When you're young you have some false impressions of that when you're going to help people they're all going be so thankful, and that's really not the case. There are a lot of people that are really hurting and you may never get a thank you and you have to just be okay with that. It's not about me getting a warm fuzzy feeling. That's not what it's about," Coleman said. Coleman first discovered his interest in helping the homeless when his 5th grade class toured the Haven. He later became a volunteer in High School. His jobs varied, but were all preparation for what was to come. "I worked in maintenance, I was changing light bulbs, sweeping floors… things like that and eventually God opened the door so that I could work here full-time. So I've had a long journey at the Haven of Rest but God's been very good. It's each individual person that the ministry is all about," he said. "It could be the smallest thing, like a guy needs a pair of pants or socks," Shane said of what can make a difference in someone's life. He also comments on the fact that all men don't show appreciation but how important it is to show kindness to them still. "There are three things you need to have when you work in the day room – patience, humbleness and grace. If you don't have any of those it's gonna be a long day," Shane laughed. "Because everyone comes in with different attitudes and they are there for different reasons. We even work with people that haven't had medication and are bipolar or something like that. You have to be able to work with different mood swings and everything. It's not always easy but you have to go with what you're dealt," he continued. Mood swings and all, Shane says he loves it regardless. "It's such a diverse group of people in there and you can't get mad and frustrated because you know they're going through tough times. You have to humble yourself and be a good listener," he said. "I have the opportunity to meet new people almost every single day because we have guys coming in and out and I enjoy it," he continued. "I've been to a couple of missions and stuff in California but nothing real steady and I've never seen such a concentration where everybody that works there will just give the shirt off their back for someone just to help them. I love what the Haven stands for," Shane said, comparing the Haven to other shelters. "I think one of the neatest things is all the resources we're able to provide," Coleman added. They admit that they don't have all of the answers, but being a Christian organization, they know the One who does. "Sometimes it's hard to know where to begin and we'll be tempted to throw our hands in the air like 'what do we do?' We just give it up to God, sometimes seeing resources and things just happen," Coleman said. Coleman shares a story of a man who was desperately in need of 25 dollars. They prayed and didn't know where it would come from but somehow, someway he received the money he needed to catch a bus and take care of what he needed that day. God made a way. "We realize that we are part of something bigger than ourselves," Coleman said. 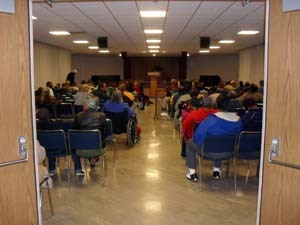 For more information on the Haven of Rest please visit www.havenofrest.org.